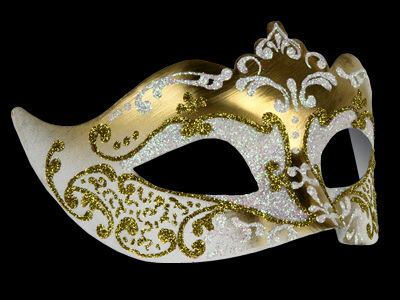 From the Simply Masquerade party mask collection, this Stella mask is crafted from glittering gold & white base which is complimented by a brilliant hand painted gold & silver glitter swirls. 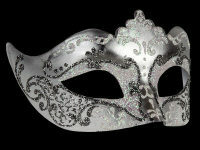 Originating from Venice, Italy this Stella design gives the traditional party mask a modern and contemporary twist. Sculptural and feminine, this collection inspires beauty in the powerful women who wear it. With traditional black satin ties this Venetian mask is perfect for your next Masquerade party, Mardi Gras Event or Venetian masked ball . No two masks are ever identical. Colours and patterns may vary slightly on each mask.